Most HHV-6 or HHV-7 infections in childhood require no specific antiviral therapy, but therapy is indicated for complicated infections especially in immunocompro-mised patients. HHV-6 and HHV-7 lack thymidine kinase and are resistant to acyclovir. The guanine analog Ganciclovir (GCV) is, however, active: 50% effective inhibitory concentration (EC50) for HHV-6A (GCV EC50 is 0.65 mg/mL), for HHV-6B (GCV EC50 is 1.33 mg/mL), and for HHV-7 (GCV EC50 >7 mg/mL). The HHV-7 GCV EC50 is greater than plasma concentrations of GCV routinely achieved with administration of GCV 5 mg/kg intravenously. The U69 gene product of HHV-6 and HHV-7 is a phosphotransferase analog of HCMV UL97, a GCV kinase. 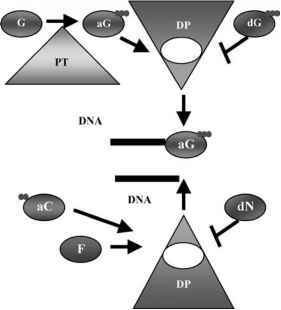 It is required to phosphorylate GCV so that it inhibits the viral DNA polymerase (the U38 gene product) (Fig. 2). The HHV-7 phosphotransferase is least efficient at phosphorylating GCV. Point mutations in the U69 and U38 are associated with GCV resistance. HHV-6 and HHV-7 can respond to GCV treatment, but a report exists of prophylactic GCV, administered to transplant recipients, failing to prevent HHV-7 replication despite adequate suppression of HCMV. nephrotoxicity, there is less experience with this agent in transplant recipients.